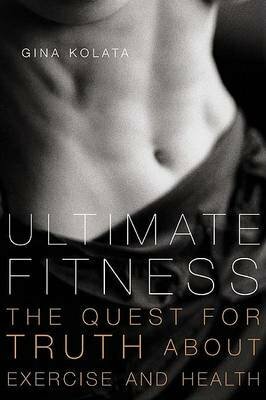 Ultimate Fitness: The Quest for Truth About Exercise and Health is Gina Kolata’s compelling journey into the world of American physical fitness over the past thirty years. It is a funny, eye-opening, brow-sweating investigation into the fads, fictions, and science of fitness training. From the early days of jogging, championed by Jim Fixx— who later died of a heart attack—to weight lifting, cycling, aerobics, and Spinning, Kolata questions such popular notions as the “fat-burning zone” and “spot reducing,” the effects of food on performance, how much exercise helps build fitness, and the difference between exercise to help the heart and exercise to change the body. She explains the science of physical fitness and the objective evidence behind commonly accepted prescriptions. Along the way she profiles researchers and mavericks who have challenged conventional wisdom, marketed their inventions, and sometimes bucked criticism only to back down from their original claims. Ultimate Fitness spotlights the machines and machinations of the fitness industry, and cuts through the marketing and hype not only to assess what is healthy, but also to understand what our obsession with staying healthy says about American culture today.